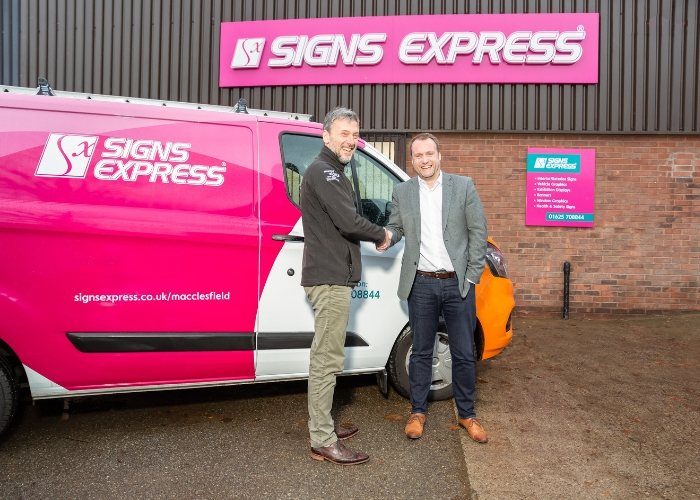 ISA-UK Member Signs Express is the largest provider of signs and graphics in the country, with a network of 65 centres around the UK and Ireland and have recently expanded with the newest addition in Macclesfield, Cheshire. The arrival of the Signs Express centre brings new opportunities for businesses to benefit from the latest innovative signage solutions and exceptional services in Macclesfield and the surrounding areas including Wilmslow, Winsford, Poynton, Middlewich, Northwich, Altrincham, Alderley Edge and Knutsford. With over 35 years experience in the sign industry, Mark Coyle, owner of the Macclesfield centre will use his expertise to develop strong relationships and deliver bespoke signs and graphics to local businesses. Mark can combine his skills of design, knowledge of large-format printing, manufacturing, and production management as well as overseeing all sales and marketing operations to truly bring the Signs Express franchise to life in Macclesfield. Complete with a fully kitted out production facility and temperature-controlled vehicle bay, Signs Express (Macclesfield) is perfectly organised to offer a full range of signs and graphics solutions including vehicle graphics, illuminated signs, office signs, exhibition displays, window graphics and much more. Just over a month in, Mark and his highly skilled team have already completed several impressive projects and are able to assist with any signage requirements you may need. Give them a call today on 01625 708844 to find out how or visit their website: https://www.signsexpress.co.uk/branch/macclesfield.